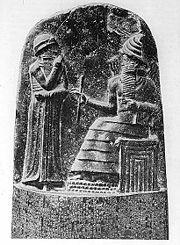 Top portion of a stele depicting a Babylonian god, probably Marduk enthroned, with the great Amorite king Hammurabi standing. 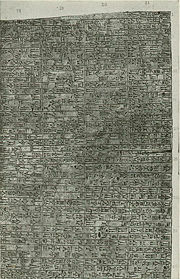 The bottom portion of the stele contains the text of the Code of Hammurabi. Amorite (Sumerian Mar.tu, Akkadian Amurrūm, Egyptian Amar, Hebrew ’emōrî) refers to a Semitic people who first occupied the country west of the Euphrates from the second half of the third millennium B.C.E.. They were originally a nomadic people whose prowess as warriors gradually brought them into a powerful position in Mesopotamia. Their rise to power brought about significant changes in Mesopotamian civilization. From 2000-1600 B.C.E., they came to dominate the region, the most famous Amorite king being the great Hammurabi. In the later second millennium B.C.E., the Amorites migrated or were pushed westward toward Canaan. There, the Israelites treated them as enemies and left several records of their defeat by Israelite heroes such as Joshua. The Amorites disappear from the historical record as a distinct population group around the sixth century B.C.E. In the earliest Sumerian sources, beginning about 2400 B.C.E., the land of the Amorites ("the Mar.tu land") is associated with the lands west of the Euphrates, including Syria and Canaan. However, the Amorites' ultimate origin may have been Arabia. For the Akkadian kings, Mar.tu was one of the "Four Quarters" surrounding Akkad, along with Subartu, Sumer, and Elam. 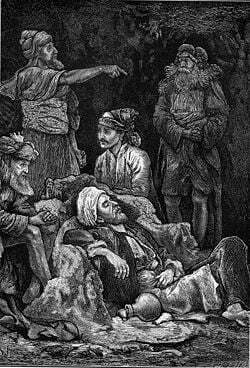 They appear as nomadic people in the Mesopotamian sources, and they are especially connected with the mountainous region of Jebel Bishri in Syria, called the "mountain of the Amorites." 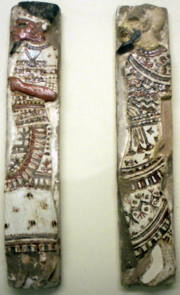 The ethnic terms Amurru and Amar were used for them in Assyria and Egypt respectively. Amorites worshiped, among others, the moon-god Sin, and Amurru, from whom their name may be taken. Amurru is sometimes described as a shepherd and the son of the Mesopotamian sky-god Anu. He is called Bêl Šadê ('Lord of the mountain') and 'He who dwells on the pure mountain.' Accordingly, it has been suggested by some scholars that Amurru might be the closely related to the Biblical El Šaddāi, the heavenly mountain deity of Abraham, Isaac, and Jacob. The Amorite language was a semitic dialect. The main sources for our limited knowledge about their language are proper names, not Akkadian in style, that are preserved in ancient inscriptions. Many of these names are similar to later Biblical Hebrew names. The Akkadian king Naram-Sin records campaigns against the Amorites in northern Syria ca. 2240 B.C.E., and his successor Shar-Kali-Sharri followed suit. From the twenty-first century B.C.E., a large-scale migration of Amorite tribes successfully infiltrated Mesopotamia. The Amorites then came to be present in a number of Mesopotamian kingdoms. The MAR.TU who know no grain.... The MAR.TU who know no house nor town, the boors of the mountains.... The MAR.TU who digs up truffles... who does not bend his knees [to cultivate the land], who eats raw meat, who has no house during his lifetime, who is not buried after death... (Chiera 1934, 58, 112). As the centralized structure of the neo-Sumerian empire of Ur slowly collapsed, its component regions began to reassert their former independence. Areas where Amorites resided were no exception. Elsewhere, armies of Elam were attacking and weakening the empire, making it vulnerable. Amorites took advantage of the failing empire to seize power. There was no Amorite invasion as such, but Amorites did ascend to power in many locations, especially during the reign of the last king of the Ur-III Dynasty, Ibbi-Sin. Leaders with Amorite names assumed power in various places, including the cities of Isin, Larsa, and Babylon. The Elamites finally sacked Ur in ca. 2004 B.C.E. Some time later, the most powerful ruler in Mesopotamia (immediately preceding the rise of Hammurabi of Babylon) was Shamshi-Adad I, another Amorite. The rise of the Amorite kingdoms in Mesopotamia brought about deep and lasting repercussions in the areas' political, social and economic structure. The division of the land into kingdoms replaced the Sumerian city-state system, in which the local temples played the most prominent role. Men, land, and cattle ceased to be owned by various gods, temples, or kings. The new monarchs endowed—or let out for an indefinite period—numerous parcels of royal or temple lands, and freed the inhabitants of several cities from taxes and forced labor. This encouraged a new society to emerge, featuring large farms, free citizens, and enterprising merchants. This new system was to last throughout the centuries. The priests, who had previously ruled on behalf of their gods, continued in the service of their deities and cared for their people's spiritual welfare, but the economic life of the country was no longer nearly exclusively in their hands. The people of the area continued to worship the Sumerian gods, and the older Sumerian myths and epic tales were piously copied, translated, or adapted. Mesopotamian religion continued its evolution from one characterized by many local deities to a regional pantheon of major and minor gods. By the time of Hammurabi, a major religious change was occurring. The storm-god Marduk came to assume the role of chief deity, and the story of his rise to supremacy was dramatically told in the epic myth known as the Enuma Elish. As for the scarce artistic production of the period, there is little to distinguish it from the preceding Ur-III era. This era of the Amorite kingdoms, ca. 2000-1600 B.C.E., is sometimes known as the "Amorite period" in Mesopotamian history. The principal Amorite dynasties arose in Mari, Yamkhad, Qatna, Assur (under Shamshi-Adad I), Isin, Larsa, and Babylon. This era ended with the Hittite sack of Babylon (c. 1595 B.C.E.) which brought new ethnic groups—particularly Kassites and Hurrians—to the forefront in Mesopotamia. It thus includes the notable empire established by Hammurabi in the eighteenth century B.C.E.. One stele of Hammurabi has been found as far north as Diyarbekir, where he claims the title "King of the Amorites." His name is the Amorite word, Ammurāpi, "kinsman-healer." The Code of Hammurabi, although not the earliest, is the best preserved ancient law code, and both the Mosaic law and the Hittite laws are apparently based in part on it or its predecessors. From the fifteenth century B.C.E. onward, the term Amurru is usually applied to the region extending north of Canaan as far as Kadesh on the Orontes. The Amorite language gradually disappeared from Mesopotamia. In Syria and Canaan, however, it became the dominant language found in ancient inscriptions until near the end of the second millennium B.C.E.. Assyrian documents dating to c. 1100 B.C.E. use the word Amurru to refer to basically the whole of Canaan and Phoenicia. Thus the Amorites of Mesopotamia seem to have been pushed or migrated west and become the Amorites of Canaan found in the biblical record. David takes the fortress city of Jerusalem, whose former king is described as an Amorite. The term Amorites as used in the Bible is sometimes interchangeable with Canaanite. At other times Canaanite is more general, and Amorite is a specific group among the Canaanites. The more specific use refers to highland mountaineers who inhabited the land of eastern Canaan, described in Gen. 10:16 as descendants of Canaan, son of Ham. In Genesis 14, Abraham is portrayed as defeating the Amorites' enemy, Kedorlaomer, who had conquered several other tribes in the area and had kidnapped Abraham's nephew Lot in the process. Later, when Abraham's burnt offering of animals results in God's informing him that his descendants must suffer oppression in Egypt, God informs him: "In the fourth generation your descendants will come back here, for the sin of the Amorites has not yet reached its full measure" (Gen. 15:16). The implication is that the Israelites were not yet justified in making holy war against the Amorites, but that they would be authorized to do so later later. In Genesis 48:21-22, Jacob, then an old man in Egypt, tells his son Joseph: "To you, as one who is over your brothers, I give the ridge of land I took from the Amorites with my sword and my bow." The tribe of Joseph/Manasseh would later occupy territory east of the Jordan which had earlier belonged to the Amorites. In some passages, the Amorites take on mythical proportions. They are powerful people of great stature "like the height of the cedars," who had occupied the land both east and west of the Jordan. The region belonging to the biblical Jordan stretched from the heights west of the Dead Sea (Gen. 14:7) to Hebron (13:8; Deut. 3:8; 4:46-48), embracing "all Gilead and all Bashan" (Deut. 3:10). These Amorites were also linked to the Jerusalem region, and the Jebusites may have been a subgroup of them. The southern slopes of the mountains of Judea are called the "mount of the Amorites" (Deut. 1:7, 19, 20). One possible etymology for "Mount Moriah," the mountain near Jerusalem where Abraham went to sacrifice Isaac, is "Mountain of the Amorites." If you... do all that I say, I will be an enemy to your enemies and will oppose those who oppose you. My angel will go ahead of you and bring you into the land of the Amorites, Hittites, Perizzites, Canaanites, Hivites and Jebusites, and I will wipe them out (Exodus 23:23). However, after the Exodus, the Book of Numbers indicates that the Israelites were willing to make peace with the Amorites, offering them the same terms given to the Moabites and Edomites: "Let us pass through your country. We will not turn aside into any field or vineyard, or drink water from any well. We will travel along the king's highway until we have passed through your territory" (Numbers 21:22). Seeing their vast numbers, the Amorite king Sihon refused this offer, mustering an army against the Israelites, who defeated him at Jahaz and claimed the city of Heshbon and its environs. They next defeated King Og of Bashan, also an Amorite, and seized his territory as well. Og is elsewhere described as the last "of the remnant of the giants" (Deut. 3:11), whose bed was 13 feet long. The defeat of these powerful kings led the people of Gibeon to conceive a strategy of trickery to convince the Israelites to make a solemn treaty of peace with them in God's name. The Gibeonites are identified in 2 Samuel 12:2 as a branch of the Amorites, though they are called Hivites elsewhere. In any case, five "Amorite" kings soon attacked the Gibeonites for making peace with the enemy. These kings were defeated with great slaughter by Joshua's forces (Joshua 10). The passage relates that the major Canaanite cities of Jerusalem, Hebron, Jarmuth, Lachish, and Eglon were each ruled by one of these five Amorite kings. These Amorities were defeated together with other Canaanite allies by Joshua at the waters of Merom (Josh. 11:8). The Israelite policy at this time was reportedly to take no prisoners, killing even the entire population of women and children in the Amorite towns which they conquered. During the period of the judges, the Amorites in Mount Heres, Aijalon, and Shaalbim were pressed into forced labor by the tribe of Joseph (Judges 1:35). In Judges 3, the Israelites are described as living peaceably among the Amorites. Israelite worship of the Amorite gods occasioned the appearance of the angel of God to Gideon in Judges 6. Later, it is mentioned that in the days of Samuel, there was peace again between the Amorites and the Israelites (1 Sam. 7:14). 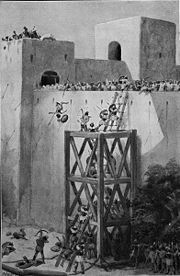 Little is said about the Amorites during the period of the Israelite kings, except that David finally captured the fortress city of Jerusalem, whose former king had been one of the Amorite rulers earlier defeated by Joshua. During the early days of the Babylonian exile, the prophet Ezekiel condemned the Jews still living in Jerusalem for infidelity by calling them children of an Amorite father and a Hittite mother. After the exile, in the time of Ezra and Nehemiah, Jews who had intermarried with Amorites and other Canaanite women were required to divorce their wives (Ezra 9-10). It is likely that some of the Amorites came to be counted among the Samaritans, the Israelites of mixed lineage who maintained a substantial rival kingdom to the Jews during the next several centuries. The Samaritans built a temple of Yahweh on Mount Gerezim with its own priesthood, following the religious laws of Moses as expressed in the Samaratan Pentateuch. Other Amorites probably blended into the Arabic, Babylonian, and Anatolian civilizations, leaving little trace after the sixth century B.C.E..
↑ Amorite Encyclopaedia Brittanica, concise.britannica.com. Retrieved May 11, 2008. This page was last modified on 16 March 2016, at 16:42.